You know you can communicate through HoneyBook in a variety of ways, and now you may be wondering, "But how do I know if my client has read my email?!" We're on it. Every time you send an email through HoneyBook, we’ll let you know whether or not it’s been read. 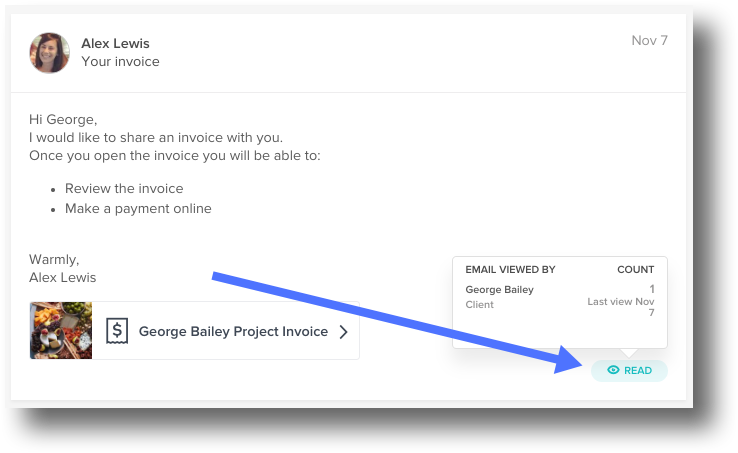 In the Activity Feed of a Project or Workspace, you’ll be able to see the full communication history between you and your client. On every email that you've sent—whether it was an email that accompanied a file, or one sent right through the feed—you'll see a note in the bottom right corner of the message denoting whether it is Read or Unread. Unread means that your email has been delivered, but your client has not opened it yet. If it’s been a little while since you sent the email, it might be a good time to follow up with your client. Read means that your email was successfully delivered and your client has opened it. By hovering over the Read icon, you’ll also be able to see who read it, when they last read it, and how many times the email has been opened. Can I sync my Gmail account?